Find out how to create 9 patch image for android application without any software or application. Android developer must be familiar with 9 patch image. The 9 patch image is a flexible PNG graphic that automatically resize to accommodate the contents of the view and the size of the screen. The selected parts of the image are scaled horizontally or vertically based on mark that drawn within the image usually by black line or black dot. 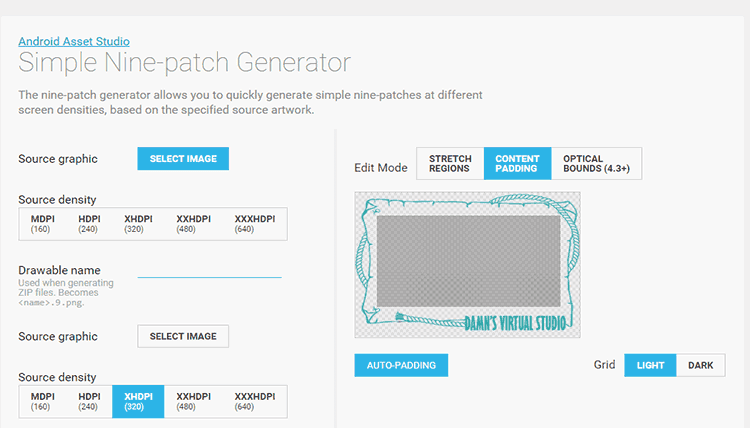 Visit the Simple Nine-patch Generator page. You can directly create your 9 patch image online. In order to use it offline, all you have to do is to save the page. Right click in your browser and choose "Save Page". Rename the saved page any name you want then save it somewhere in your computer. Easy, you don't need to visit Simple Nine-patch Generator page anymore. And no software or application should be install, all you need is only a browser. The only minor thing of this trick is You can not the image in zip bundled package. But that's not really a big deal, You can save it manually. Or choose only what you need. I found this trick myself when modifying BBM apps for Android. Have a look and please try my modded app at BBM with Privacy Protection Features. Thank You for reading, and good luck!